If you are looking for a super simple yet delicious appetizer, this Mexicorn Dip is just what you need. Only 4 ingredients and a few minutes required to make this delicious dip. **Update: This post was originally shared in 2013. Photos and text have been updated to better reflect the voice and style of this blog. ** I have a big problem with chips and dip. I just cannot control myself. That creamy, salt, crunchy combination is just the best and I’ll never give up on it. I am not a quitter. 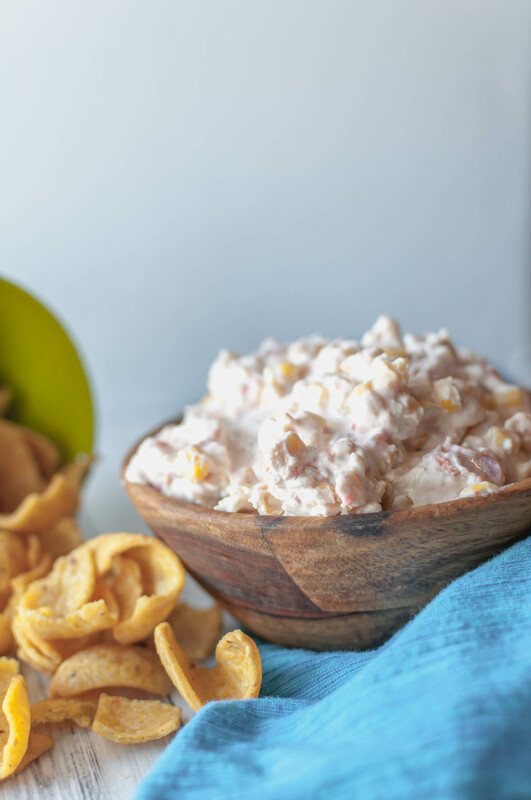 We have a few favorite dips that grace the table at family gatherings and holidays and cucumber dip and this Mexicorn Dip are at the top of the list. Both contain gobs of cream cheese. Coincidence?! I think not. I mean honestly, is it really dip if cream cheese isn’t involved? One of my favorite things about this dip is the simple, easy ingredients. And only 4 of them. Cream cheese, rotel, Mexicorn (or fiesta corn) and cheddar cheese. It isn’t fancy and it may not look super appetizing but you guyyys. It’s good. And since we’re keeping things real classy, it’s best when dunked with corn chips. Specifically, the scoops corn chips so you can maximize your chip to dip ratio. Important things happening here people. This is the perfect dip to bring to a spring or summertime cookout. Just remember, it’s best if made the night before so keep that in mind when you plan on making it. Mix cream cheese, rotel, Mexicorn and cheddar cheese. Refrigerate overnight. Enjoy with Frito scoops.